Witness the clash of position and power when Miss Julie arrives on DVD (plus Digital), Digital HD and On Demand May 5 from Lionsgate Home Entertainment. The film stars Academy Award® nominee Jessica Chastain (Best Actress, Zero Dark Thirty, 2012) and Golden Globe® winner Colin Farrell (Best Actor, In Bruges, 2009) as lovers mixed up in the madness of a midsummer night. 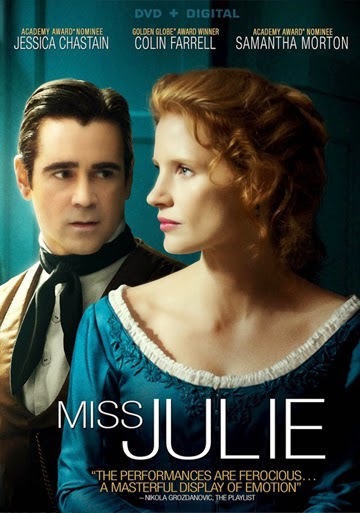 Miss Julie, based on the play of the same name, will be available on DVD. Jessica Chastain and Colin Farrell take a sizzling turn as a wealthy aristocrat and her father’s valet whose innocent flirtation turns into a heated and dangerous affair that tests the boundaries of class and desire. Academy Award® nominee Samantha Morton (Best Actress, In America, 2003) costars in this searing tale of power and seduction.